The nature of the UK’s interchangeable climate means that no-one ever quite knows what to expect weather-wise. It can be glorious sunshine one minute, and tipping down with rain the next. It is a luxury to be protected from the elements while outdoors. It’s never fun being caught in a downpour or, if you’re in a rush, waiting until the rain stops. Even being out in the sunshine, with the harmful UV rays, is considered bad for the skin. We all want to be protected from the elements while getting on with daily life. One solution is to provide a covered walkway at your premises. The great thing about covered walkways is that they can be applied to any setting because they are so versatile. For example, in a retail environment, enabling your customers to browse undercover will improve their retail experience, which will lead to repeat business. During bad weather, if your facility includes weather protection, this could influence your potential customers’ decision to visit you over your competitor. 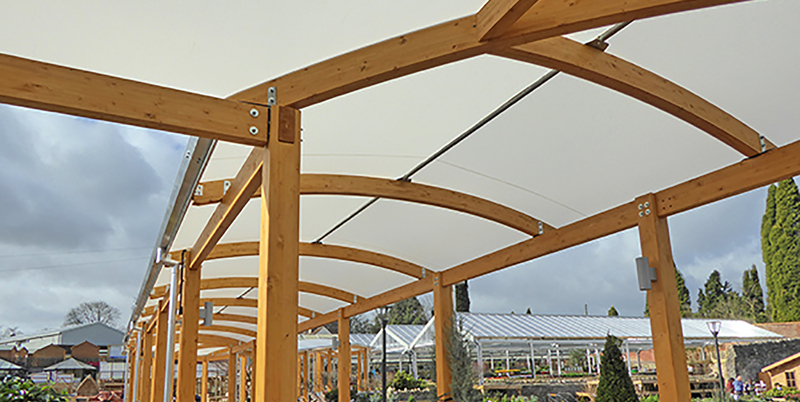 If you have outdoor retail space, such as a Garden Centre, a walkway can double up as a guide for your customers. It allows your customers to flow past products they may not have even been looking for! This impulse buying will also improve your sales figures. In Healthcare settings, walkways can help to connect buildings. It shows that you care about your patients, staff and visitors. Covered walkways in hospitals are particularly useful, as you can transport patients from one building to another without the need to take them outside. Keeping patients dry and comfortable is crucial. Weather protection is also very important if your hospice is housed across more than one building. Patients requiring end of life care may want to visit another area of the hospice, for example communal areas or the chapel. A covered walkway at your hospice will protect patients and medical equipment from the weather. Covered walkways are a great solution for Education settings, particularly for larger institutions with lots of buildings. Keeping your staff and pupils dry between lessons or lectures will result in happier classes! No excuses for being late, waiting for the rain to stop. Please get in touch with our team today to see how we can help you with your covered walkway requirements.